Florida is home to a seemingly endless number of amazing things: beaches, resorts, theme parks, seafood, surfing, hiking, you name it. Add one more thing to the list: expensive homes. 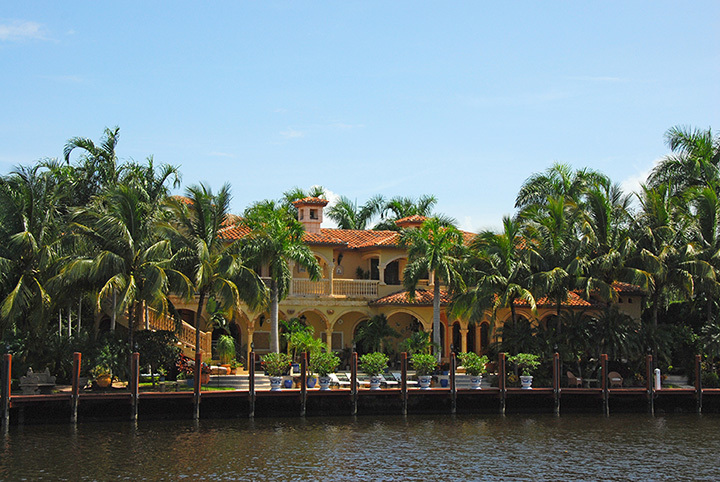 Though places like California and New York are notorious for pricey real estate, Florida is also a top contender for some of the most exquisite mansions in the country—for a price, of course. Take a look at these 10 amazing expensive homes recently sold in Florida and let your dreams run wild. Sold for a whopping $43.7 million in 2017, some might agree this is quite a deal compared to a listing price of $67 million in 2015. This massive nine bedroom, 10.5-bathroom estate sprawls more than 20,000 square-feet and comes with one of the most hard-to-find amenities in upscale Florida real estate: acreage. Situated on more than two full acres, the mansion comes complete with gym, pool, nanny quarters, and breathtaking views of Biscayne Bay and the Miami skyline. Once listed as high as $48.9 million, this gorgeous home sold in 2017 for just $40 million. Nine bedrooms and 11.5 bathrooms are just the beginning to this 35,000-square-foot home. The beachfront access, pool, fitness center, wet bar, spa, and grilling area will make every day feel like vacation—you’d never want to leave home! If you couldn’t afford residence at the previous home, perhaps you could have afforded to be their neighbor at this luscious property, which sold for just over $28 million in 2016. Public record shows that this home was sold for a modest $975,000 in 1999, meaning it’s increased more than 28 times its value in less than two decades. Just $34 million could have landed you this exclusive property in Palm Beach, along with 200 feet of shoreline and some of the best ocean views money can buy. Situated on almost a full acre—a rarity for ritzy Floridians—some might call it a steal, especially since it was once listed for $47 million. Not too far from Casa Bendita, this luxurious home was sold in 2017 for just over $36 million, a 661 percent gain over its selling price in 1996 at just $4.75 million. This breathtaking mansion features nine bedrooms for its staff in addition to the 11 bedrooms for the mainstays. At almost 10,000 square-feet, the ocean views alone might have made the deal worth it. Nothing short of a masterpiece, this exquisite home sold for a cool $20 million, just $4 million under asking price. The outside itself is a sight to behold, but the glorious ocean views and amenity-filled interior leaves you wanting for nothing. A dance club, tiki bar, Zen garden, gym, library, steam room, sauna, tennis court, and infinity pool are just the beginning. Sold for $22 million, this contemporary abode (dubbed Casa Clara) screams sleek and modern that befitting for every creative type. If you’d had the cash, you could’ve woken up to stunning views of Biscayne Bay and the Miami skyline or enjoyed its brilliant yet calming gardens. No detail was left overlooked, both in decor and design. Selling for just over $17.2 million, one look at this amazing estate may have you wondering how it didn’t sell for more. Situated directly on beautiful Biscayne Bay in a gated community, the house itself was inspired by the Vanderbilt mansion in Miami Beach. The home features plenty of unique and elegant indoor and outdoor living spaces, each providing unparalleled experiences that will make you never want to leave home. Though a bit on the smaller side compared to the other homes, this $14 million mansion more than makes up for its size with its views of Admiralty Bay and interior amenities. With a kitchen fit for any chef, a huge aquarium, and wine room, you’d find plenty of excuses to stay in for the night. Last sold in 2016 for a breezy $32 million, this splendid home is back on the market for a modest increased price of $37.75 million. Expansive and elegant, the lucky buyer can expect waterfront views, boat lift, dock, guest house, and masterful landscaping. It’s over 13,000 square-feet of pure WOW!